1. Start in Down Dog and tune into your breath. Once your breath is steady and engaged, then start your practice. This will help you stay focused. 3. Move your right hand underneath your nose on the mat, and spread your fingers wide like a pancake. IF you have injury in any part of your arm, please drop your bottom knee on the floor to support your body weight from here on out. 4. Carefully roll to the side, opening hips and stack your feet on top of each other, lifting the hips as high as you can, reaching the left hand straight up to the ceiling. 5. If you are feeling fresh, lift your top leg a few inches off the other while lifting hips. This will increase your balance and strength practice. 6. 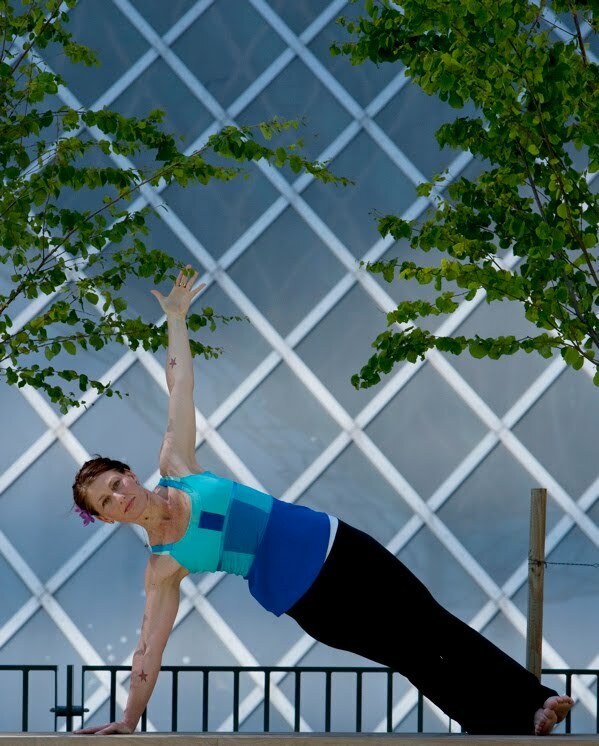 Hold Side Plank for 5-10 breaths and repeat on opposite side. 7. Rest in Child’s pose with hands by hips for 10 breaths before moving into the rest of your practice. 1. Drop bottom knee to the floor, and keep it there. 2. Rest on forearm for side plank instead of wrists, to protect injured parts. 3. Engage your core, and lift kneecaps for max focus on strength. Stay like a board, not sagging in the hips, shoulders, etc. Side Plank is one of my favorite poses to build the core strength and awareness for more complex poses and inversions. I am available for private Yoga coaching at SAC, if you have any questions about this pose or want to enrich your on going practice!